Klaus Berger, Odilon Redon, Phantasie und Farbe, Cologne, 1964, no. 547, n.p. While working mostly in black and white until the 1890s, Redon’s art underwent a major transformation around the turn of the century. He abandoned drawing in charcoal and print-making in order to embrace brilliant colours in his art. Thematically, his focus shifted from exploring the dark, fantastic and mysterious, to the enchanting grace and fragile beauty of the natural world. 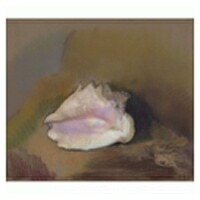 Flowers, seashells, butterflies and sea creatures became favoured themes in his later paintings, pastels and watercolours. Redon created this charming, well observed and intensely colourful study of fish in memory of a visit to the Aquarium in Arcachon, on the French Atlantic Coast, in 1912. The ocean has always been a special source of fascination for Redon, and particularly in his later career he dedicated numerous paintings and pastels to the world beneath the sea. His famous canvases Underwater Vision (c.1910, MOMA, New York), and Oannes (c.1900-1910, Kröller- Müller Museum, Otterlo, The Netherlands) for example, are both inspired by a passage in Gustave Flaubert’s novel The Temptation of St. Anthony: “Exhini whirl like wheels; ammonites uncoil like cables; polypi unfold their tentacles; sponges float hither and thither; anemones ejaculate water; wrack and sea-mosses have grown all about.” In most of his ocean themed paintings, however, Redon doesn`t depict fish but rather focuses on smaller organisms like mollusks, crustaceans and corals, “reflecting his longtime fascination with the sea as a metaphor of transformation and as the cradle of life. The author of this article, Marius-Ary Leblond, was actually not a real person, but rather a pseudonym for two people: Georges Athénas (1877-1953) and Aimé Merlo (1880-1958), two cousins, who both had moved from the Island of Réunion in the Indian Ocean to France in the mid 1890s in order to pursue careers in literature. Under the pen name Marius-Ary Leblond the two published fiction, essays and articles for art periodicals, and won the Prix Goncourt in 1909 for their novel En France. Georges Athénas (alias Marius Leblond) was also a former owner of the present watercolour, which he probably received as a gift directly from the artist. 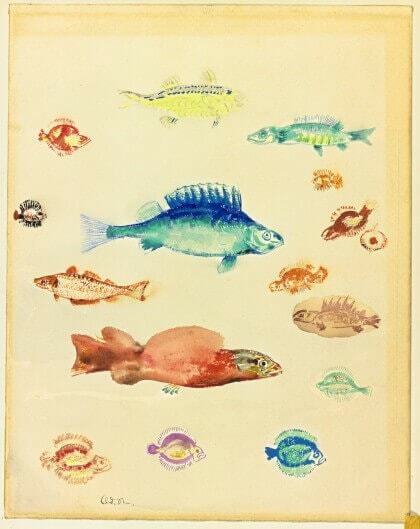 According to a handwritten note on the verso of the work, celebrated art historian John Rewald, acquired Poissons for his wife in the late 1950s and included it in several of his publications. It later passed hands to Elizabeth and Alex Lewyt, prolific art collectors, who are known as important benefactors of the Metropolitan Museum, New York. 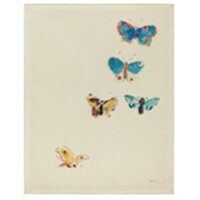 Odilon Redon, Five Butterflies, c.1912, watercolour, National Gallery of Art, Washington D.C.